Champlain Orchards is a family owned and operated farm located in Shoreham, Vermont. They are well known for their apples, but also grow berries, cherries, nectarines, plums, pears, and peaches! Guests have enjoyed picking their own here for decades and are likely to continue for years to come, thanks to the farm’s commitment to sustainability. Apart from being an active member of the community, Champlain Orchards also practices ecologically-friendly land stewardship. The farm itself is powered entirely by solar. With such an abundance of apples, it shouldn’t be surprising that Champlain Orchards also makes their own hard cider! 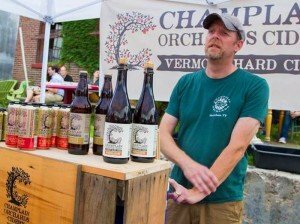 The cider, which they press on site, has become a staple in Vermont’s craft cider industry. If you’re looking for a good entry into the world of cider, then we recommend one of our personal favorites Pruner’s Pride. It’s an easy-going cider, crisp and refreshing, and crafted in homage to the more traditional ciders. 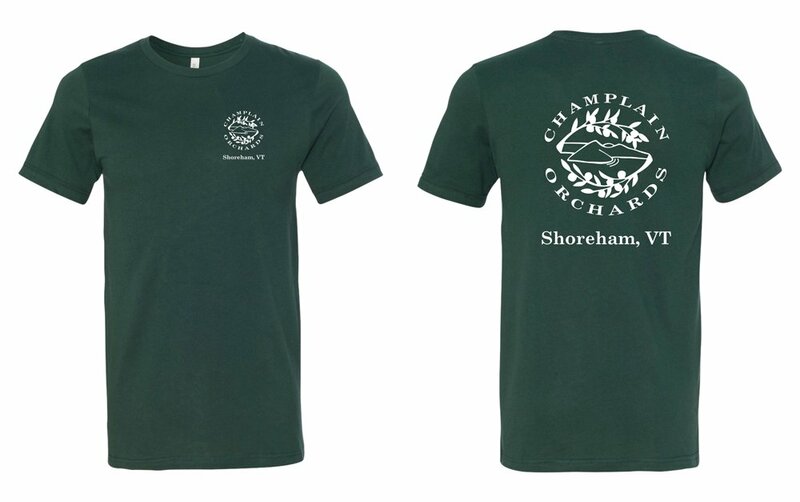 We’re glad to work with Champlain Orchards in meeting their custom apparel needs. They feature a sylized logo prominently on the shirt. High contrast makes the Champlain Orchards design easy to read. Simple stylish apparel appeals to a large audience! Here is an excellent example of custom apparel working well for a company. Champlain Orchards, apart from their wholesale operations and cidery, also has a store on the premises. After a long day of picking apples and having fun with friends and family, customers make their way back to the store – and there are the company tees! Shirts are a great souvenir, but they also give customers a chance to connect with the business. In a place like Vermont, where people are eager to support local farms, these t-shirts are worn with pride. Custom apparel results in loyal customers while boosting brand awareness!